Late winter in Yellowstone National Park is its quiet season: no crowds, no noise, just the serenity of awe-inspiring landscapes and the wildlife that inhabit them. The only road open is the Northeast Entrance Road between Mammoth and Cooke City, which traverses the Lamar Valley, home to bison, wolves, and bighorn sheep. Traveling the road in late winter means very few cars and even fewer people outside of their cars. In other words, a visit to Yellowstone in late winter is highly recommended. 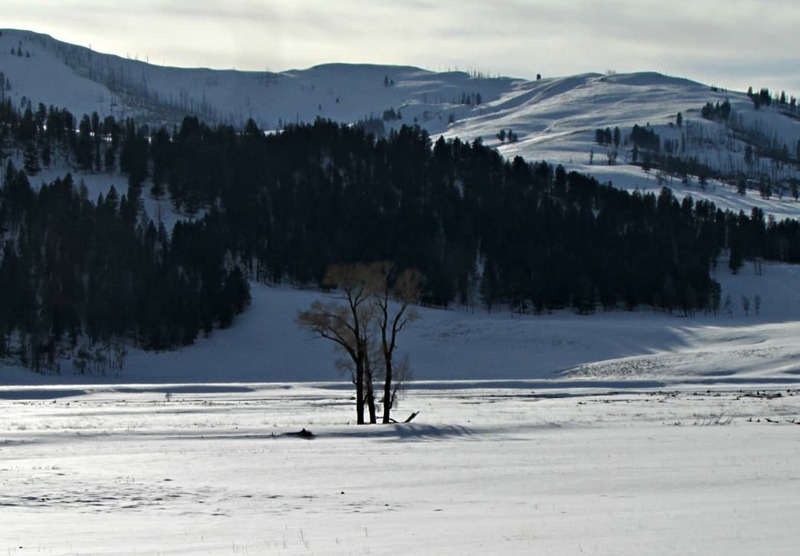 To get to the Lamar Valley in winter, you’ll have to come from the north, specifically Livingston, MT, a quintessential small Western town, despite its proximity to Yellowstone. Just four miles from the park is the town of Gardiner, which hugs the shores of the Yellowstone River. It has a long history with Yellowstone, at one time providing the comforts of civilization to soldiers stationed at Mammoth in the late 1800s. As you wind up through the canyon of the Gardiner River, check the hillsides for flocks of bighorn sheep or herds of elk. 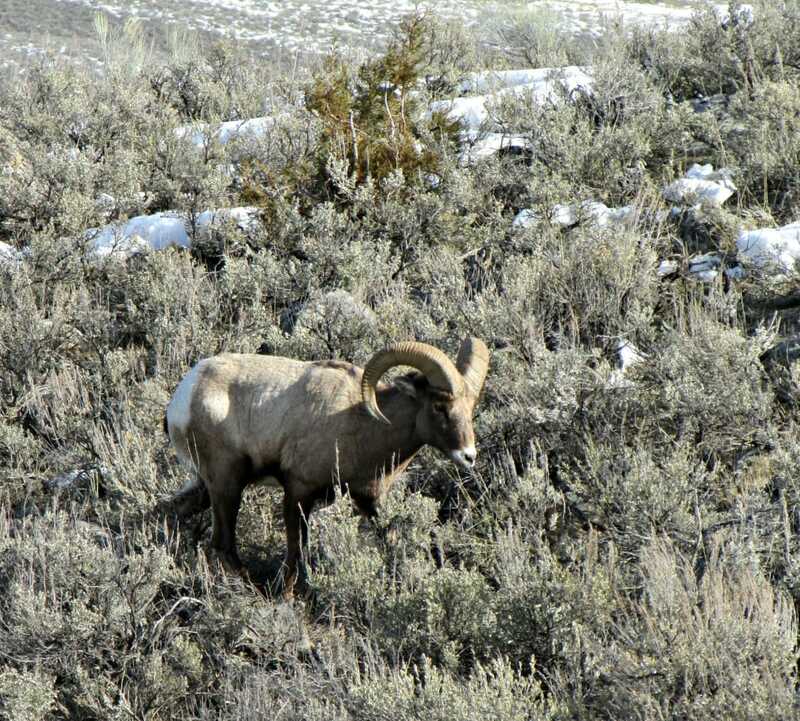 Winter pushes bighorn sheep out of the high country – Leslie Colin Tribble. At Mammoth, choose from several trails to hike; due to the low elevation, there’s generally not a lot of snow to contend with. Hike the boardwalk through the terrace formations starting from the bottom for a decent workout. You can also hike the 5-mile Beaver Ponds Loop Trail, which begins at the parking lot just north of Liberty Cap. You might encounter snow while hiking up Clematis Creek gulch, but it shouldn’t be too deep. From Mammoth, you’ll take the road out toward Tower Falls, meandering through some large, old Douglas Fir and junipers. Take a moment to stop at Undine Falls, one of the park’s 300 waterfalls, less than 10 minutes from Mammoth. The outer wall of water freezes during the winter, but water still flows underneath. You can also stop and ski or snowshoe the half mile trail to Wraith Falls, just five minutes past Undine. This trail travels through some open sagebrush before veering left into the drainage that hides Wraith Falls. 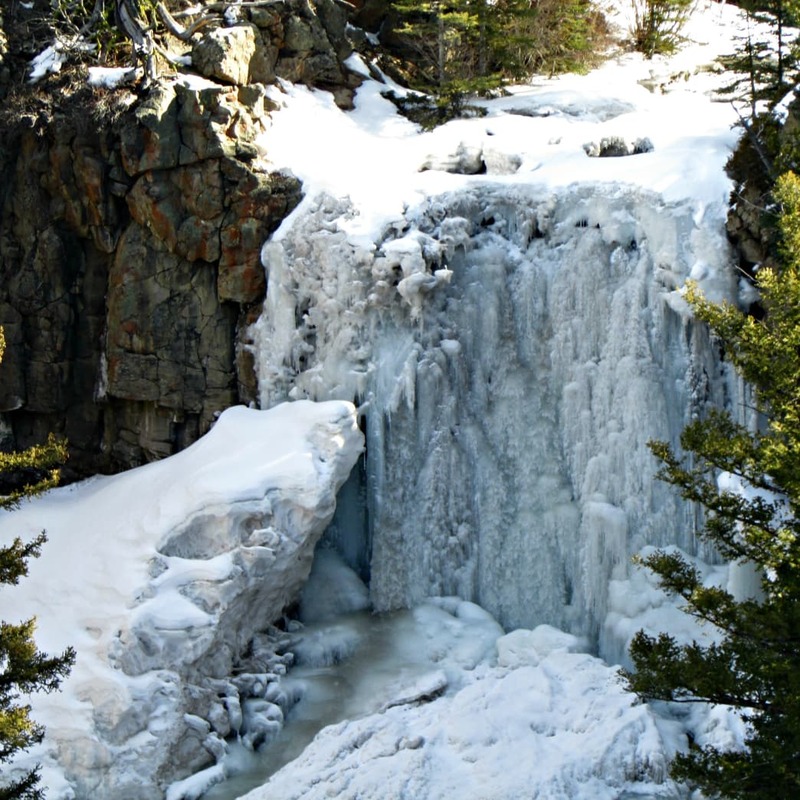 Frozen Undine Falls – Leslie Colin Tribble. From Wraith Falls, the landscape opens up with trees giving way to sagebrush. This northern strip of Yellowstone has a lower elevation than the rest of the park. 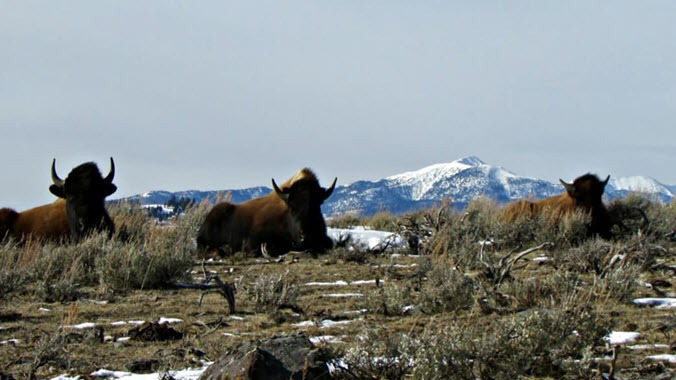 Keep an eye out for herds of bison near the Blacktail Creek Trail. 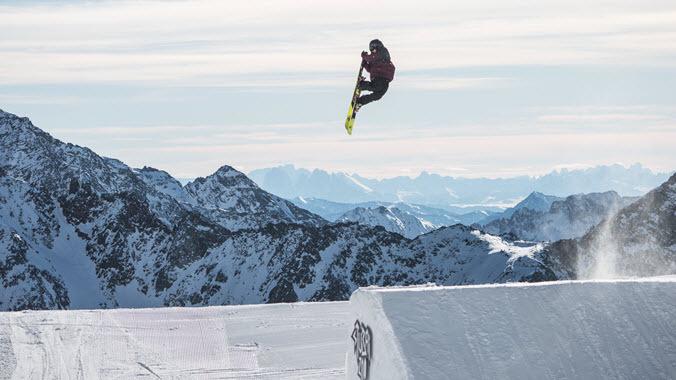 Depending on the winter, the trail can be free of snow for the first mile. Most of the time, it’s a great ski out to the suspension bridge over Blacktail Creek at just under four miles. The section from Blacktail Creek to Pebble Creek Campground is prime for wildlife watching. Bison are everywhere, trying to find enough grazing to sustain life. Late winter is the hardest time to be a grazer, but prime time to be a predator. 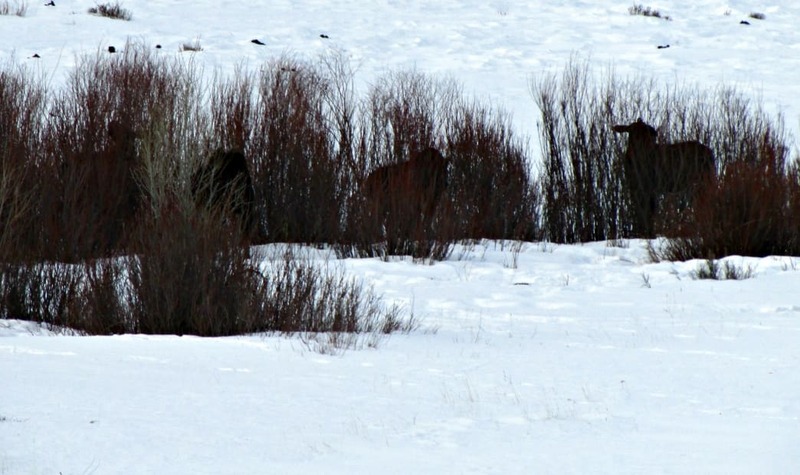 Grazers that have hung on through the depths of cold and snow often can’t make it any longer. Many grazers die during late winter, creating a food surplus for wolves and smaller carnivores. On a recent visit, two wolf packs were feeding on prey. The first was the eight members of the Lamar Pack who had chased a cow elk off a cliff. The second was the 11 wolves of the Prospect Pack who were dining on a bison. An early out-of-hibernation grizzly attempted to join the feast but was no match for that many wolves. Quiet – Leslie Colin Tribble. Both wolf packs were far from the road, too far for decent photos, but animal researchers and watchers will usually provide intel on where they are. Anytime you’re in Yellowstone, especially the Lamar Valley , and see lots of folks with huge camera lenses or spotting scopes, you should stop. Chances are they’re watching a wolf or grizzly bear. 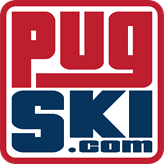 At the northeast corner of the park, there’s a great ski trail. 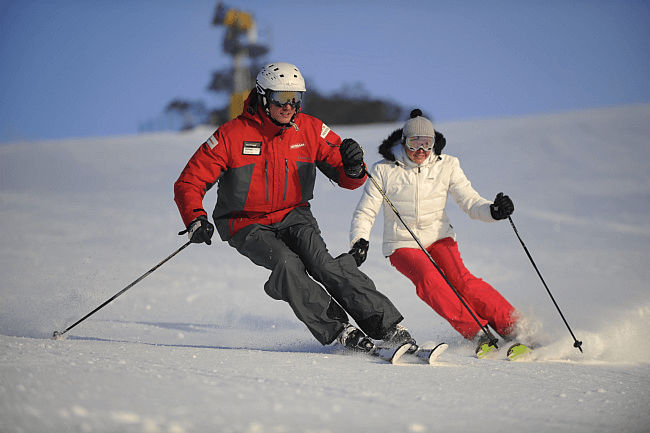 You can ski the willow flats between the Lower Baronette and Upper Baronette parking areas. 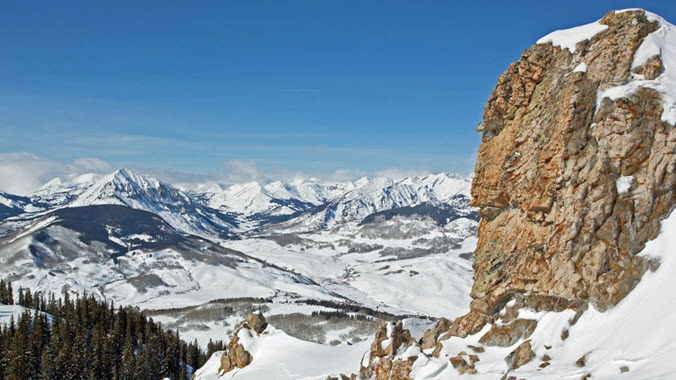 The 3.5-mile trail is well-marked and actually follows the old road from Cooke City, with views of the towering peaks of the North Absaroka Range. You’ll need to negotiate bison and coyotes along this route and possibly a moose or two. At the Lamar River Trailhead, keep an eye out for moose. How do you hide 4 , 1800 pound animals? – Leslie Colin Tribble. You may even be the only person watching the wildlife. Be sure to savor the solitude, because it only happens this time of year.